Bodhi Art showcases the work in Indian contemporary artists not only through exhibutins in the gallery space, but also by supporting residencies, public art projects, and the organization of outreach programs. 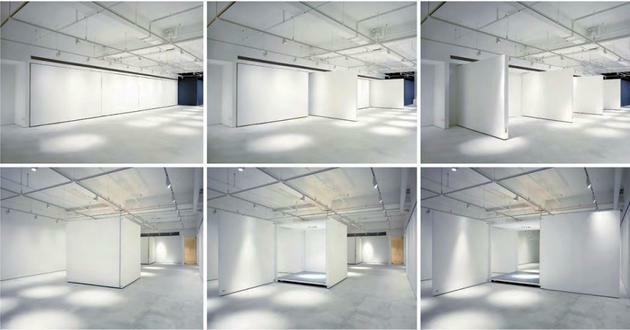 The client’s brief required a flexible space with maximum display options to provide for the needs of the various disciplines of modern art. 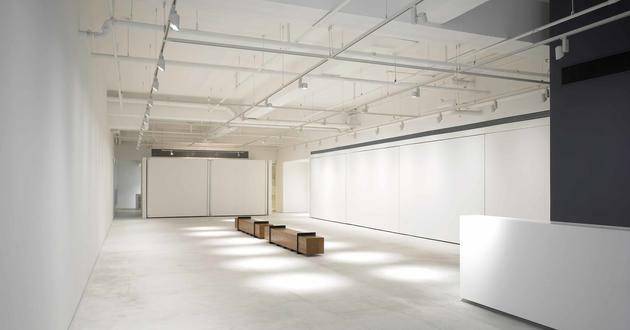 The gallery is also to function as an office with meeting rooms, thus demanding a contemporary look befitting a gallery which represents Indian contemporary art on a global stage. The main gallery space, measuring 8 metres by 20 metres, is carved out of the tight site. A grid distributes lighting evenly above, with provision for supplementary lighting as needed. Two distinct types of exhibition panels are available. The first is a series of panels that pivot out from the side walls of the gallery. Measuring 3.7 metres wide and 2.7 metres tall, these panels are made of plywood timber with a steel and timber stud frame within. Heavy duty castors and a pivot system is carefully hidden from view. In their closed position, the panels are flush, forming a second wall on the existing reinforced concrete wall. The second type of display comprises to mobile boxes. In their closed position, these cubes measure 2.7 metres on each side. They have built-in castors, and are stored in a niche at the end of the gallery. Made of a steel structure with a tile finish, the four side walls can be pivoted off the vertical main frames. According to the needs of the artists, these mobile units can be placed anywhere in the gallery space and be opened up or used as containers. The combination of these two forms of exhibition panels offers the gallery an inspiring array of organizational possibilities. Two viewing benches complement the seating. Made of a solid timber section with steel frames, they are an organic antithesis to the clean, minimal setting. Mobile boxes on built-in castors can be placed anywhere in the gallery when required and also act as containers when closed. Pivoted wall panels act as a double skin to the walls when closed and as display surfaces when opened. 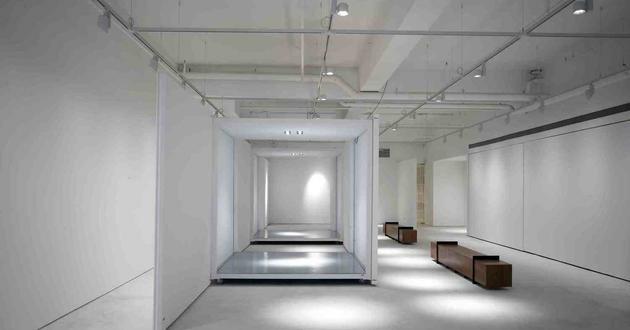 Myriad displaying options are provided to cater for the varying needs of the gallery space showcases.